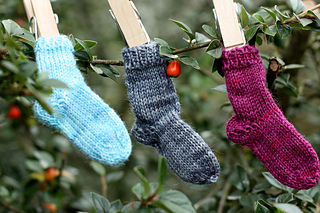 These teeny tiny socks make great little gifts as keyrings and are just big enough for a humbug or similar sweet. They can be easily adapted to be stripey, fairisle, etc. Made in a tiny amount of 4ply (approx. 10g) or DK for a slightly bigger sock, they have short row heels (with no holes) and quite in-depth instructions (aimed at folks who have never used the short row technique before). 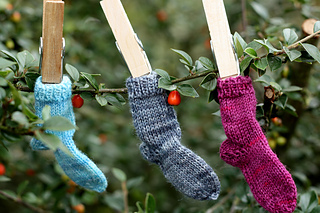 Since this is a free pattern, feel free to share it with your friends or knitting group, and sell your teeny sock ornaments if you wish - just please do not sell the pattern with or without yarn, and do not distribute it. If you spot any mistakes please let me know!